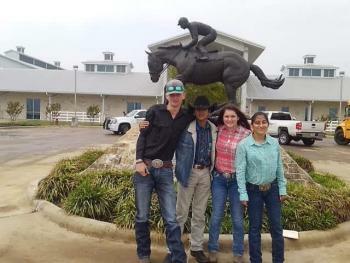 The Horse Evaluation team from Hempstead FFA placed 3rd at the Area 11 CDE competition held at Texas A&M University on Saturday, April 6, to qualify for state. Members of the team include Nerix Espinosa, Jake Gregory, Kayleigh Schwarze and Alyssa Harvey. Individually placing in the top 15% of the 105 competitors at area, Schwarze placed 13th and Harvey places 16th. The team, coached by FFA Advisor Benjamin Burkhalter, will compete at the State FFA CDE Competition in Lubbock on April 27. Good Luck at state Hempstead FFA!